It was a clear October Tuesday when a truck destroyed Ross and Michelle Stephens’ caravan. Returning home after a weekend enjoying the V8 Supercar championship on Queensland’s Gold Coast, the couple was within 15 minutes of their north Brisbane home when the truck struck them. 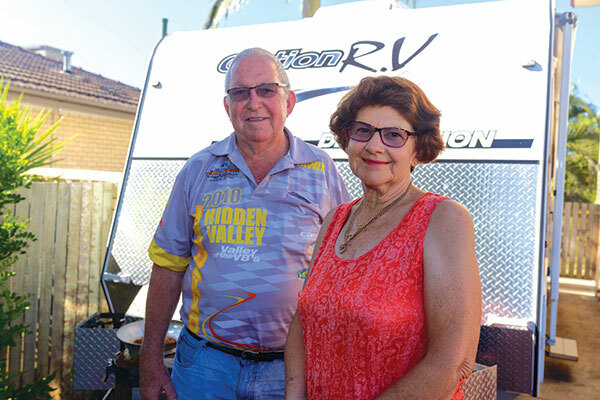 Beyond their interest in motorsports, as caravanners, the Stephens have almost two decades of experience touring Australia’s highways, especially in recent years as members of the Queensland Masonic Touring Club. Until that moment, and despite completing two laps of Australia, their travels had been free of any significant accidents. They’d got underway early but still the traffic became heavier as they got closer to Brisbane until they found themselves stopped in a traffic jam; stuck in centre lane of three lanes of stationary traffic. 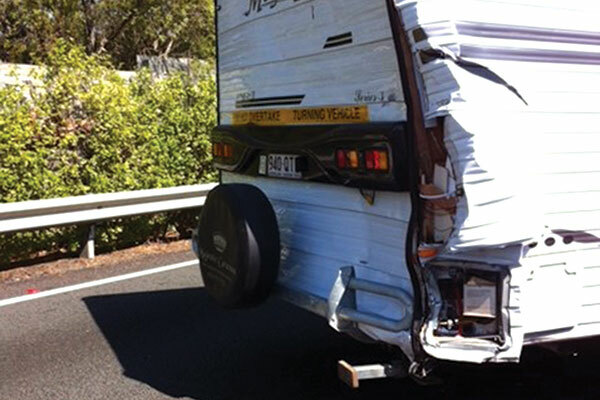 Instead, the 8-tonne truck speared into their rig, causing an accident that enveloped the Stephens’ tow vehicle, their caravan, and another motorist in a Holden Commodore. The incident blocked the highway for three hours and saw emergency services battling through the traffic to rush to their aid. For many travellers, it sounds like an all too familiar scenario. Many of us have experienced that stomach-churning glance in your rearview mirror which shows an ambulance rapidly coming up behind you, its lights flashing and siren blaring. You are between the ambulance and a potentially life-threatening emergency. So what do you do when you’re towing a caravan and an ambulance comes rushing up behind you? Or, worse still, if no ambulance is forthcoming and you are the first responder or first on the scene at a road accident? While Ross and Michelle were unhurt and everyone else involved came out unscathed also, their situation highlights a daunting scenario that might have had a totally different outcome if it had been an isolated stretch of road. 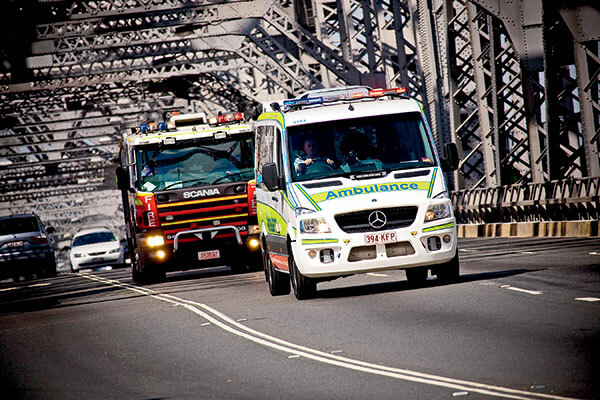 There are some slight differences in the laws between states regarding yielding to ambulances travelling with lights and siren, but the upshot is the same – you must give way. The trouble is, however, knowing where, when and how to give way safely – especially when towing. 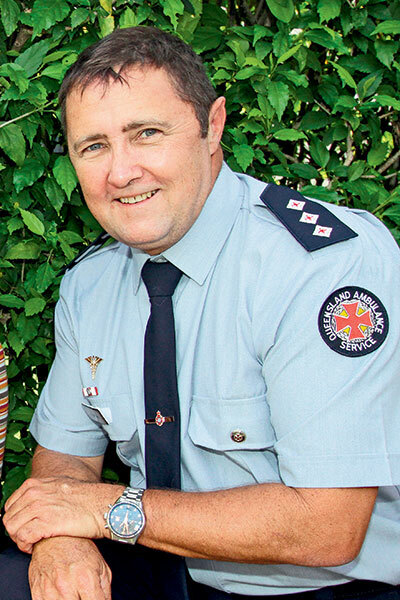 With 20 years’ experience as an ambulance officer, Queensland Ambulance Service (QAS) superintendent Gavin Farry has some answers. And his experience in Queensland outback’s and central west regions, centred in Longreach, covered a remote area larger than Victoria that’s also very popular with caravanners. Superintendent Farry said the first thing is for drivers to be aware at all times and constantly checking their mirrors. “Nowadays, drivers tend to drive around with their windows wound up, so you often won’t hear an ambulance but you will probably see it,” he said. Vision will probably be your first warning of an approaching ambulance so, it’s always important to be constantly scanning the road – both ahead and behind you. Superintendent Farry said that when you do see an ambulance in your mirrors, keep calm. 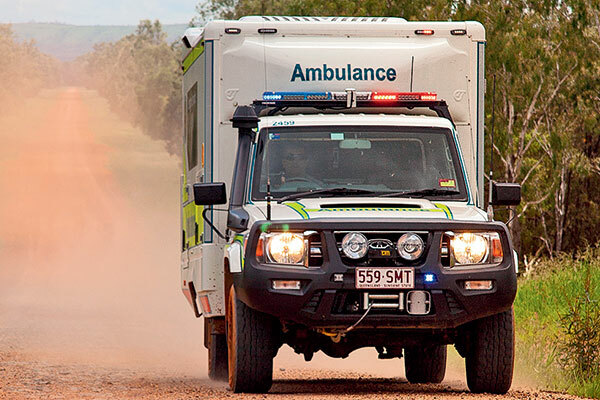 Just because you’ve seen an ambulance approaching, doesn’t mean you should stop or move your vehicle immediately. The safest approach is to gently slow down and wait for the ambulance to find an opportunity to overtake. Ideally, drivers should pull over to the left-hand side of the road if possible. Superintendent Farry said, like trucks, an approaching ambulance will overtake a caravanner “when they feel it’s safe”. He said it’s pointless for vanners to use hand signals to try and tell the ambulance when you feel it’s safe for them to overtake. “Hand signals will be ignored. We will move around when we feel it’s safe to do so,” he said. It’s also very important that drivers stay relaxed and don’t let the ambulance behind stress them out. “That can quite often prompt drivers to immediately prop and that’s certainly not what we want them to do,” Superintendent Farry said. And caravanners should not feel that they need accelerate to allow the ambulance to move quicker, if they can’t get off the road. Staying calm and gradually slowing is very important and, according to Superintendent Farry, well within the caravanner’s legal obligations. If you come across a road accident, ensuring you remain safe is your first priority. Look out for debris on the road and take blind corners with caution, in case there’s an accident around the bend. Superintendent Farry said that if you pull over to attend an accident, you should leave at least 200m between you and the accident so other drivers can see you and slow down in time. Your next step should be to call 000 to receive advice on how to handle the situation and get emergency services on the way, if required. Carrying a first-aid kit in your vehicle is essential, not only for road accidents but for your own safety. You could also download a free smartphone app called Emergency Plus that can provides GPS coordinates of the location of the accident. “The coordinates can then be provided to the emergency dispatcher to pinpoint the patient’s exact location,” Superintendent Farry said. The app is available for IOS and Android phones and could save valuable time in emergencies if you aren’t sure exactly where you are. In addition, Hema maps or a portable GPS device, together with a CB or UHF radio, are also useful to help communicate with emergency services or other road users. Helping at a road accident can be traumatic and the aftermath isn’t limited to mending the broken bodies of those caught in the accidents, first responders may need help to deal with it as well. ST John Ambulance spokesperson Paula Price said travellers should keep in mind services like community help lines and support networks such as Beyond Blue, Lifeline, Kids Helpline and The Samaritans. Medical professionals and GPs can advise people about counselling services and support group programs, if required.